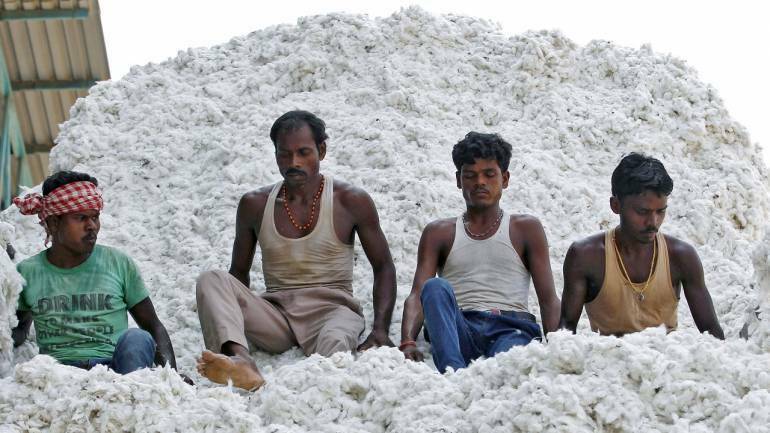 The Cotton Association of India on December 7 lowered its November estimate of the cotton crop by three lakh bales to 340.25 lakh bales for the 2018-19 season. The decline in cotton crop estimate is mainly due to unfavourable weather conditions, CAI said in a statement. Last month, the association had estimated cotton output at 343.25 lakh bales for the 2018-19 season, which began on October 1. CAI reduced the crop estimate for Gujarat by three lakh bales, Maharashtra by one lakh bales and Telangana by 1.50 lakh bales. However, it increased the crop estimate for Haryana by one lakh bales and upper Rajasthan, lower Rajasthan and Andhra Pradesh by 50,000 bales each. The association has projected total cotton supply during October and November at 95 lakh bales, which consists of the arrival of 70 lakh bales up to November 30, imports of two lakh bales and the opening stock at the beginning of the season as on October 1, that the CAI has estimated at 23 lakh bales. Further, the association has estimated cotton consumption during October and November at 54 lakh bales, while the export shipment of cotton up to November 30, at 10 lakh bales. The stock at the end of November 2018 is estimated at 31 lakh bales, including 27 lakh bales with textile mills and the remaining four lakh bales estimated to be held by Cotton Corporation Of India (CCI) and others (MNCs, traders, ginners among others). The total cotton supply till end of the season is estimated at 390.25 lakh bales of 170 kg each, which includes opening stock of 23 lakh bales at the beginning of the season, cotton crop for the season at 340.25 lakh bales and imports of 27 lakh bales, which are estimated to be higher by 12 lakh bales, compared with the import figure of 15 lakh bales estimated for the 2017-18 crop year. The CAI has estimated domestic consumption for the season at 324 lakh bales, while the exports at 53 lakh bales, which is lower by 16 lakh bales against the exports of 69 lakh bales estimated during last year. The carry-over stock at the end of the 2018-19 season is estimated at 13.25 lakh bales.